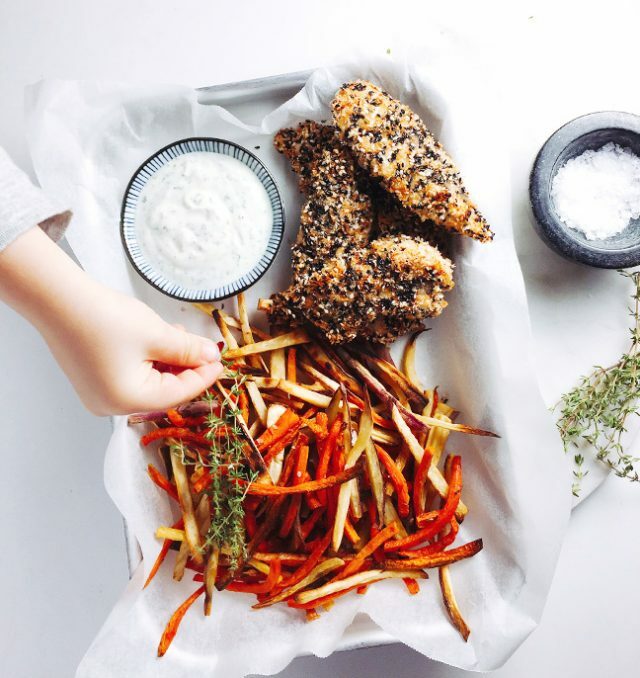 Who doesn’t love chicken and fries? Unfortunately most of the time this kind of dish isn’t exactly good for us, so I have an alternative. 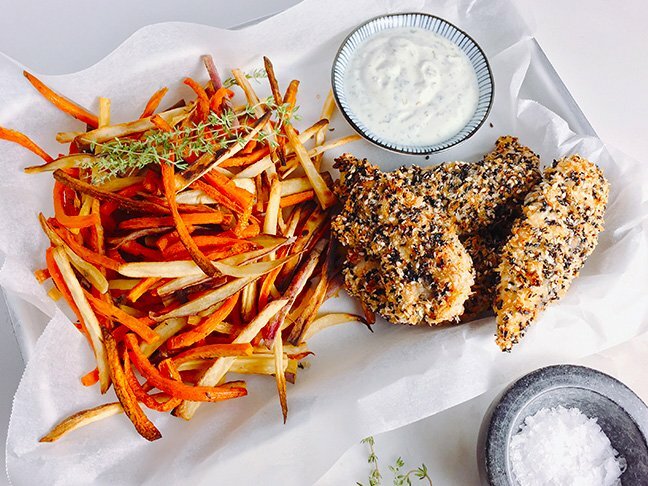 Healthy baked chicken strips with a crispy sesame coating and root veggie fries that are made using sweet potato, carrot, and parsnips. You simply chop the vegetables into matchsticks, this speeds up the cooking and ensures they turn out nice and crunchy, and bake in a hot oven for 25 minutes using very little oil. Easy. 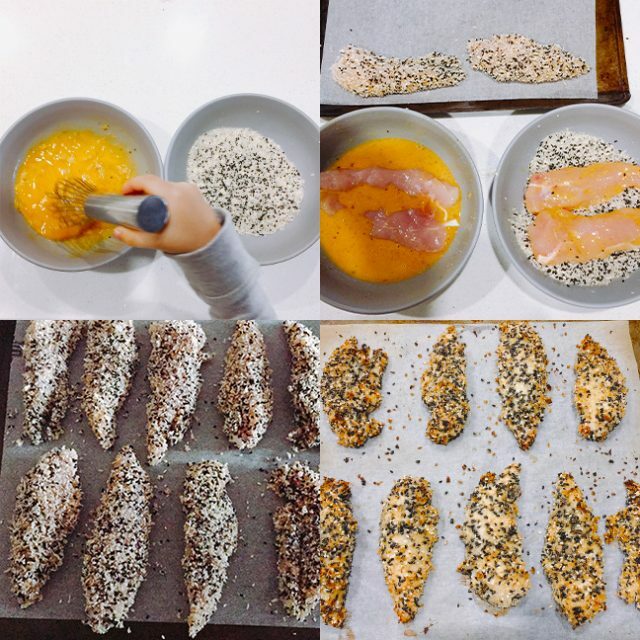 While that is happening, prepare your sesame chicken by crumbing it in a mixture of panko crumbs and sesame seeds. I have used a mixture of white sesame seeds and black sesame seeds here, but a combination isn’t required. Serve with a simple side salad and dipping sauce and this dish is sure to be a hit with the whole family. Choose any root veggies you like; beetroot, turnip, daikon and celeriac would also work well. Served with a simple side salad and dipping sauce and this dish is sure to be a hit with the whole family. Step 1: Pre-heat oven to 200°C. 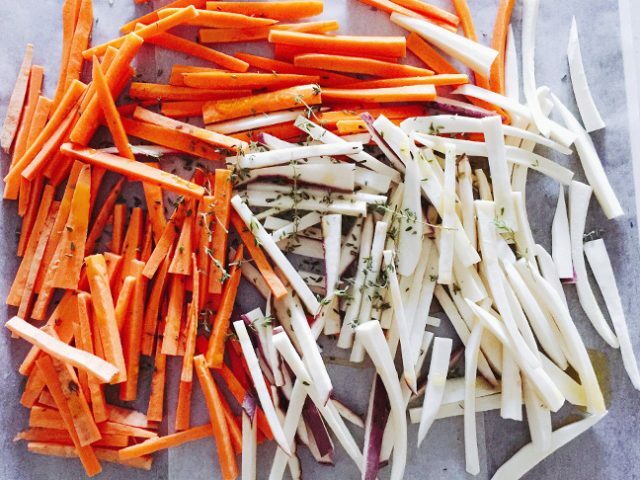 Peel the carrot and parsnip. Give the sweet potatoes a good scrub as we will leave the skin on. 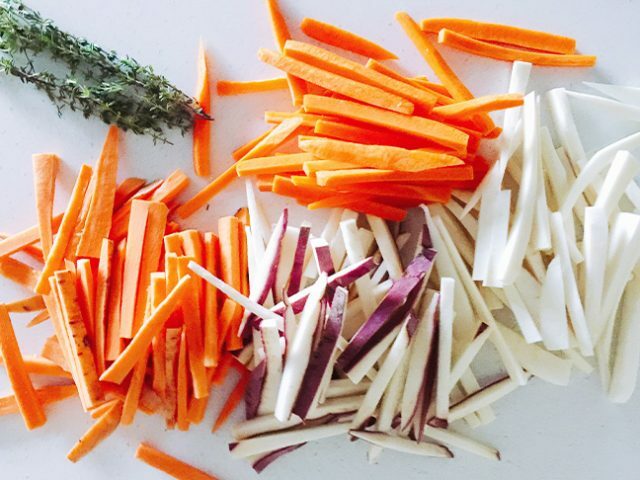 Slice all the vegetable into matchsticks of the same size so it ensures even cooking. Step 2: Place in a bowl and add 1 tablespoon of olive oil and the thyme leaves. Season well. Toss until all the vegetable are evenly coated. Add an additional tablespoon of olive oil if required. Place on a tray in a single layer (you may need two trays) and bake for 25 minutes, tossing half way through cooking. They are ready once golden and crispy. Step 3: While the fries are baking, spray a tray lightly with oil and line with baking paper. Combine the eggs and mustard in one bowl and the panko crumbs, sesame seeds and salt in another. Dip the chicken pieces in the egg and then into the crumbs. Place on the baking tray. Once there is approximately 10-12 minutes cooking time remaining for the fries, add the chicken pieces to the oven and bake for 10-12 minutes or until cooked through. 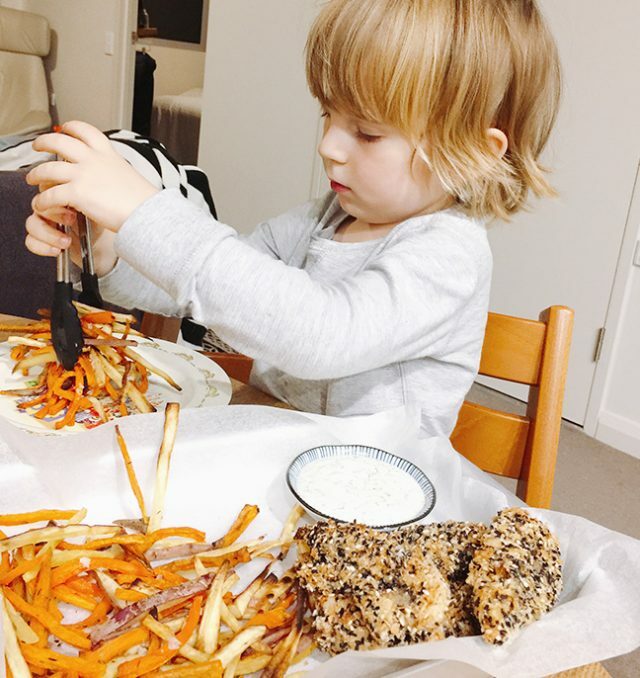 Step 4: Add fries and chicken to a serving tray and 2,4,6,8... Serve with a simple side salad or dipping sauce if you wish. Notes: Because the cooking time is so little for the chicken, they don't brown up very much. Flick the oven over to the grill for 1-2 minutes to achieve a golden colour. Alternatively, dry roast the panko crumbs in a frying pan before you begin.